This can be a problem, even in first-world countries, as the effective network connection type a user has might not actually be 3G, 4G or WiFi. You can be on coffee-shop Wifi but connected to a cellular hotspot with 2G speeds. Only shipping the code a user needs. Code-splitting can help here. 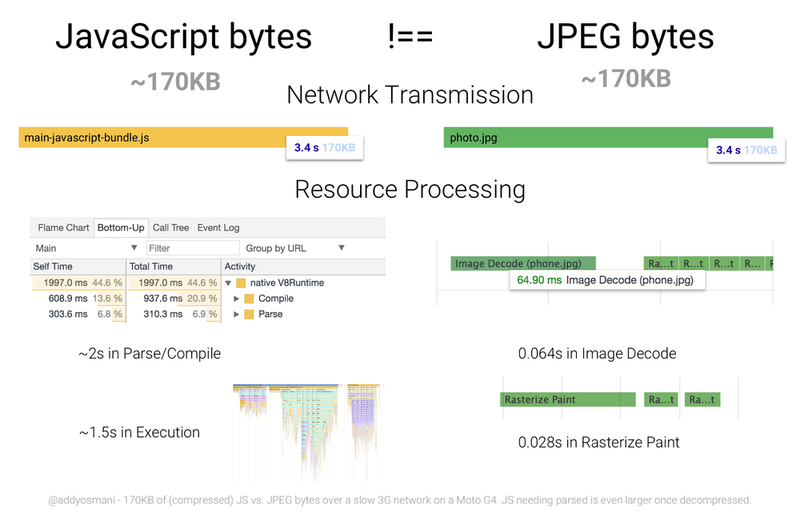 Compressing it heavily (using Brotli ~q11, Zopfli or gzip). Brotli outperforms gzip on compression ratio. It helped CertSimple save 17% on the size of compressed JS bytes and LinkedIn save 4% on their load times. Removing unused code. Identify with DevTools code coverage. For stripping code, see tree-shaking, Closure Compiler’s advanced optimizations and library trimming plugins like lodash-babel-plugin or Webpack’s ContextReplacementPlugin for libraries like Moment.js. Use babel-preset-env & browserlist to avoid transpiling features already in modern browsers. Advanced developers may find careful analysis of their Webpack bundles helps identify opportunities to trim unneeded dependencies. Caching it to minimize network trips. Determine optimal lifetimes for scripts (max-age) & supply validation tokens (ETag) to avoid transferring unchanged bytes. 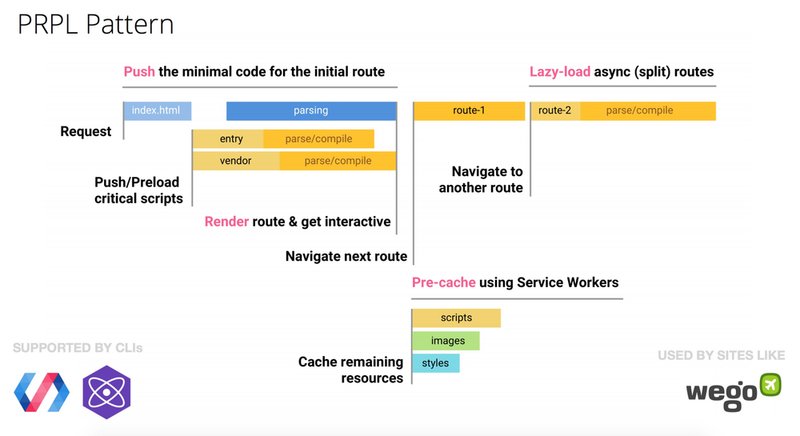 Service Worker caching can make your app network resilient & give you eager access to features like V8’s code cache. Learn about long-term caching with filename hashing. 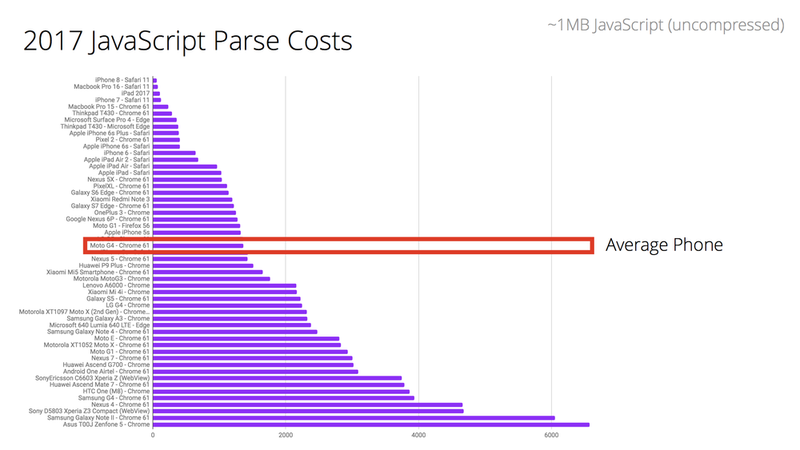 When we talk about parse and compile being slow; context is important — we’re talking about average mobile phones here. Average users can have phones with slow CPUs and GPUs, no L2/L3 cache and which may even be memory constrained. Parse times comparing the performance of Apple’s A11 Bionic chip to the Snapdragon 617 in more average Android hardware. This highlights the importance of testing on average hardware (like the Moto G4) instead of just the phone that might be in your pocket. 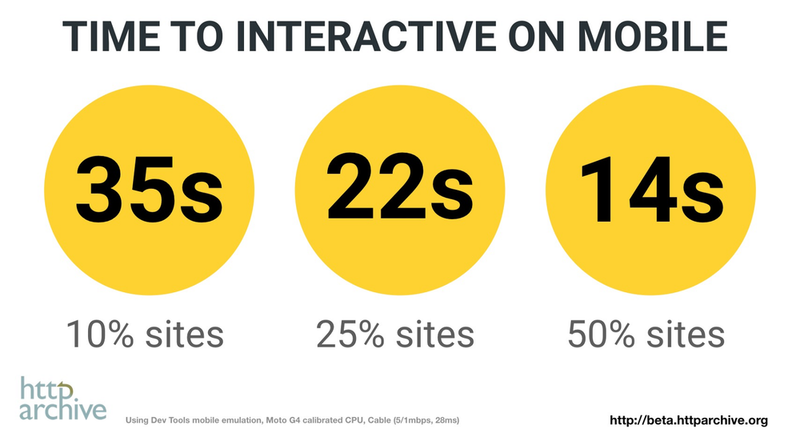 Context matters however: optimize for the device & network conditions your users have. 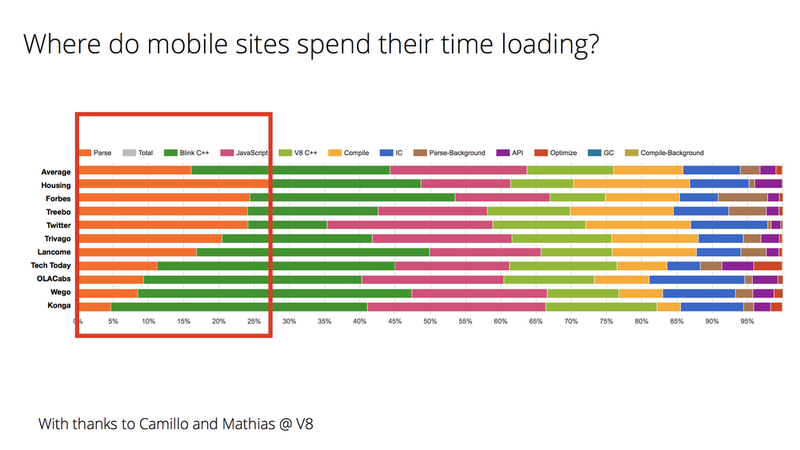 Analytics can provide insight into the mobile device classes your real users are accessing your site with. This can provide opportunities to understand the real CPU/GPU constraints they’re operating with. 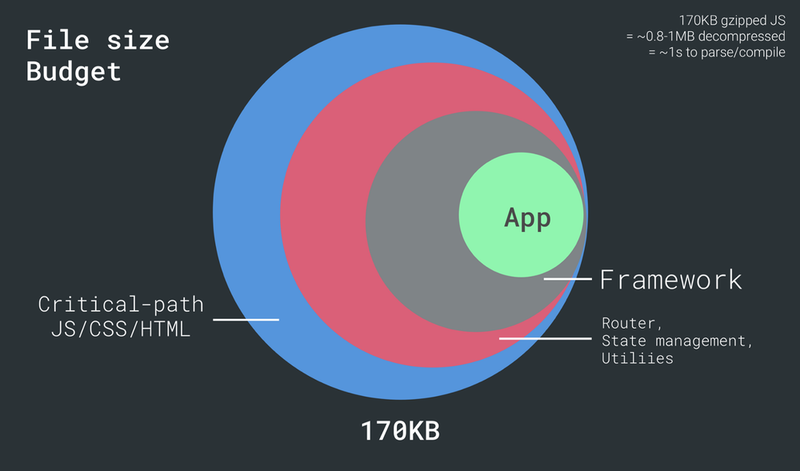 It’s useful to consider how much JS “headroom” the architectural decisions we make can leave us for app logic.